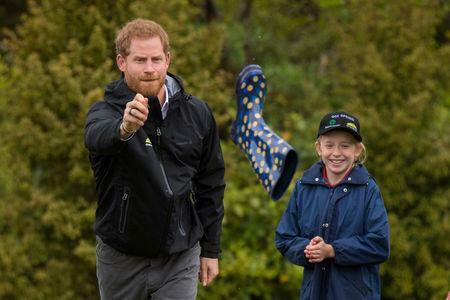 WELLINGTON (Reuters) - Britain's Prince Harry and his wife Meghan threw rubber gumboots on Tuesday as children cheered in a competition in New Zealand's largest city of Auckland, though Harry's team ended up losing to his wife's side. "There wasn't too much of a rivalry," Isabella Iti, 10, said after the gumboot toss. "I think she was thinking that there was no chance that she would win. But she did." 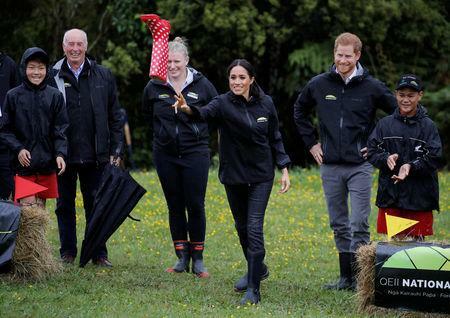 The Duke and Duchess of Sussex were visiting a conservation area north of Auckland that had been set aside as part of a Commonwealth initiative to honour Queen Elizabeth's 66 years on the British throne. 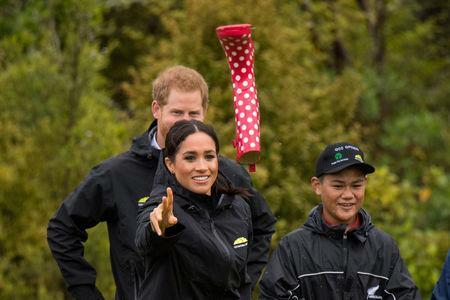 There, the couple split off and each led a team of cheering children in a competition to see who could throw a rubber rainboot - known locally as a 'gumboot' - the farthest. Meghan, wearing black J Crew jeans and a Karen Walker blazer, led her team to victory after tossing a blue boot about a metre (3.2 feet) further than Harry's red one. For their wedding in May, Meghan and Harry had asked for charitable donations in lieu of gifts. The New Zealand government gave NZ$5,000 ($3,271) to Pillars in recognition of couple's interest in programmes that support vulnerable children.